The JVC VN-C655U Dome has been discontinued. No direct replacement is available. Designed for high-performanCE .NETwork-based 24/7 surveillance, the VN-C655U Dome from JVC is equipped with a 1/4-inch high-resolution Interline Transfer CCD, 25x Zoom, 30fps at VGA Mode and Day & Night Features. The removable IR cut filter ensures optimum performance around the clock. 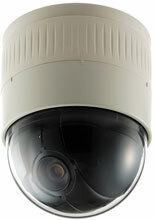 This network dome camera is the industry's first full function dome camera with built-in web server. Other remarkable features include extended dynamic range, super-lolux sensitivity, privacy mask/motion detection, 3-level password protection, auto patrol, pan and tour, 100 pre-set positions, and versatile camera control.